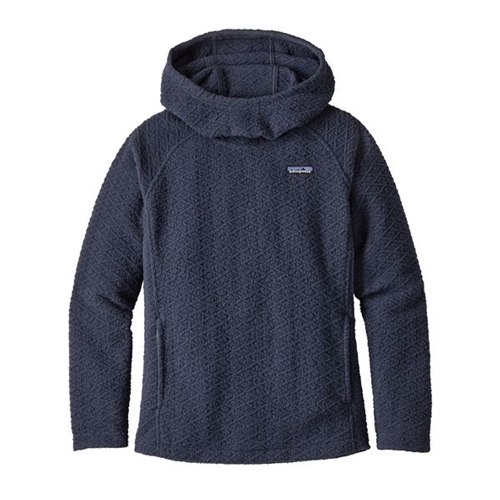 The women's Patagonia Diamond Capra Hoody has a tall neck and zippered kangaroo pouch. This Capra hooded sweater jacket is so warm and comfortable with a feminine diamond ribbing pattern. The inside is soft and fleecy. The length of the sleeves and body provide perfect coverage. This hooded sweater is perfect for cold days as either a sweater or as a jacket. For chilly van chores or chilled-out Shavasana, this supersoft hoody is made more interesting with shearling fleece in a diamond-shape cabled pattern. With a tall neck and slouchy hood for cooler conditions or quick catnaps. Raglan sleeves allow for added mobility, and princess seaming flatters front to back. Mesh lined marsupial pocket is secured with zippers and lined with soft-brushed fleece. Hip length layers well over tights, jeans or wet bikini bottoms. Fair Trade Certified™ sewing. *Beginning with our Spring 2015 styles, we've improved our women’s fit: There’s a slight increase at the waist for shaping and to ensure the fit is truer to size. All other measurements, such as chest and hip, remain the same. Please refer to our new, updated Women's Size Chart for details. Note: this change applies to full-price Spring 2015 styles, not to past-season or on-sale items. ** Inseam will vary depending on style; when lengths are offered, "short" is 30, "regular" is 32 and "long" is 33, unless otherwise noted. on 3/6/2019 Love, love, LOVE! This exceeded my expectations! All the great reviews on this hoodie are true, it’s comfy, well made, flattering and most of all worth the price tag. I ordered a size up and glad I did, it falls just past my hips and makes wearing leggings with it appropriate. I ordered smolder blue and calcium both in XL (I’m 5’5 170lb) Wyoming fly fishing provided quick, hassle free ordering. I highly recommend, aces all around. I bought this hoodie about a month ago, and I struggle not to wear it every day! It’s so warm and cozy. I love the large fitting hood. I chose “century pink,” which I would describe as salmon. Looks good with jeans, leggings, anything! I love it so much, I think I might buy another color. Patagonia makes some of my favorite gear. This piece is already one of my favorites! It's soft and the fit is very feminine. Previous reviews were correct that it is more of a burnt orange color. The color is actually gorgeous and unique. I also want to shout out to Platte River Fly Shop. This is the second purchase I've made from them. I randomly found them on the internet. Couldn't be more pleased with their customer service and products. I love this hoody so much but I can only wear it on very cold days as it is very warm. I love the tall collar on it so I can snuggle down in it and the kangaroo pocket is nice. It's fleecy on the inside and a very cute diamond ribbing on the outside. I love the roots red color which is more of a burnt orange. It has a nice length on the body and sleeves.